Poor Natasha Bedingfield. Girl can't seem to catch a break in the U.S. these days. Her last album tanked here in America and now, a song on which she's featured, fails to chart. Pity. What happened to her over here? 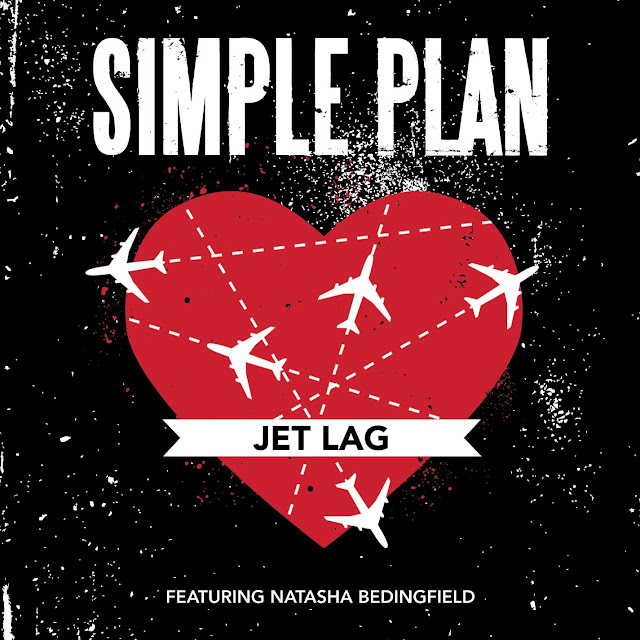 "Jet Lag" is the second official single from French Canadian pop punk band Simple Plan's forthcoming album Get Your Heart On! The single was released on April 25th in the U.S., Canada and UK and is scheduled to come out May 25th in the rest of Europe. I'm assuming Simple Plan featured Bedingfield on the track as some sort of a draw for it's U.S. and UK release, especially considering another version of the song was released with French-Canadian singer Marie-Mai. Unfortunately, "Jet Lag" has yet to make any moves on the U.S. Billboard chart. In Canada the song peaked at #43 and in Australia the song peaked at #52. The song isn't bad, but I wouldn't say it's anything amazing either. It's fairly standard pop-punk fare with Bedingfield providing the pop element to the song. She certainly does her thing, complementing Simple Plan lead vocalist Pierre Bouvier quite well. The video does a good job at depicting an intercontinental, long distance relationship. Filmed at the Toronto Pearson International Airport, the band appear in the airport while Bedingfield takes on the role of the "lover" on the other end of the world. Get Your Heart On! is due out via Lava/Atlantic Records on June 21st. The album's first single, "Can't Keep My Hands Off You" was released as a promotional single at the end of March, featuring guest vocals by Weezer frontman Rivers Cuomo. Produced by Brian Howes (Puddle of Mudd, Daughtry) the 11-track album also features collaborations with Alex Gaskarth of All Time Low and K'naan. Check out the video for "Jet Lag" below and download the single on iTunes HERE. You can also pre-order the album on iTunes HERE. Note: So apparently the version of the single released in America was the one with French-Canadian singer Marie-Mai. The only version with Natasha Bedingfield is the video (BELOW).